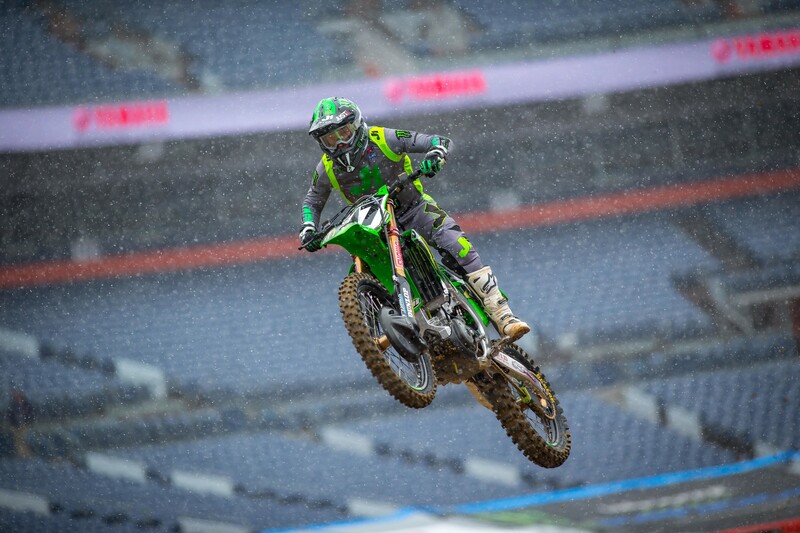 Tomac won the race last week in Nashville, indicating he might have righted the ship after a series of sub-par weeks. He cautioned that he couldn’t be sure things were right until he did it again, though, and boy did he tonight in Denver. Even on a track most riders said was hard to pass on, Tomac made moves from about fifth to get into first place alarmingly quick. 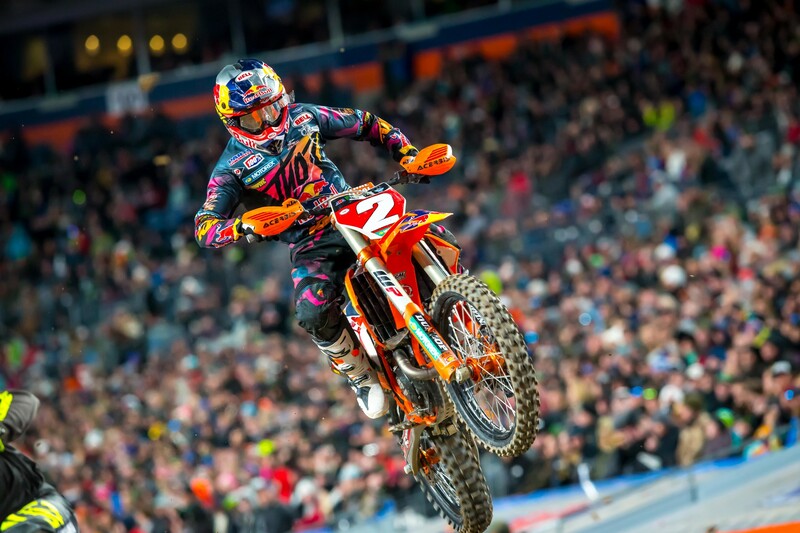 He reeled in race leader Marvin Musquin and made short work of him to take the lead and the win. It stayed exciting, though, because the crowd was going crazy the whole way. “That was the loudest race I’ve ever been in, ever,” said Tomac, of Monster Energy Kawasaki. “Probably double the loud level. So for Tomac all the news was good, although his hopes to make significant ground on series’ leader Webb didn’t come to fruition. As he has done all season, Webb made the most of his situation. Was he the second-fastest rider in Denver? Maybe, maybe not, but he still finished the race in second, meaning Tomac only made up three points. Webb and Tomac started side-by-side early in the race, but Tomac made quick passes on teammate Joey Savatgy and Justin Bogle, and then set sail after Musquin. It took Webb much longer to get going, and his battle with Savatgy was fierce. 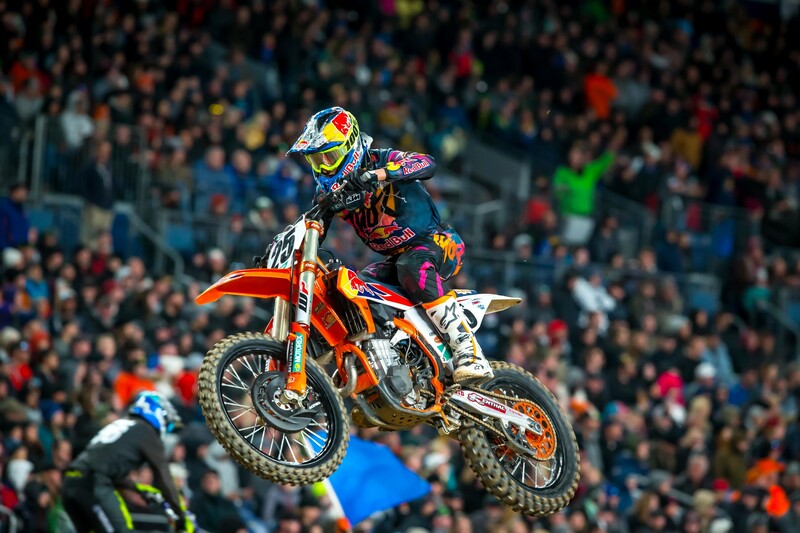 Once get got clear race track, he rode well and tracked Musquin down to take second. 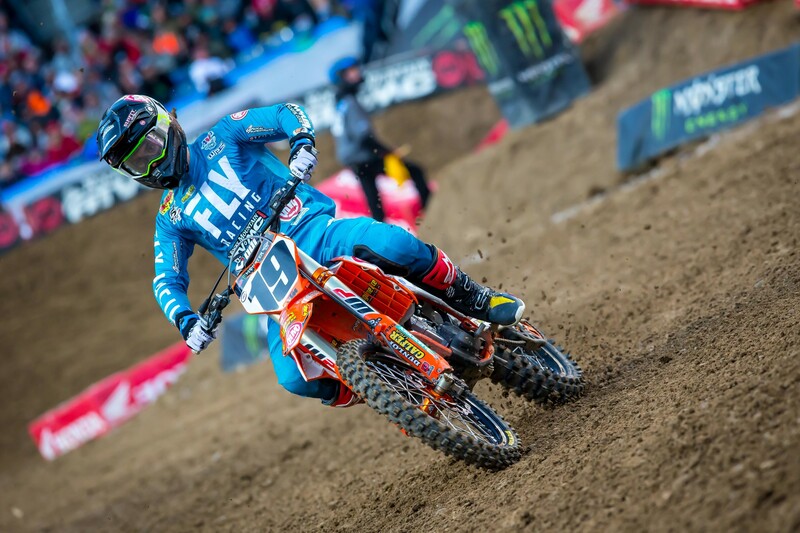 Musquin has had weekends where he was the fastest guy in the main event, but this was not one of them. The Red Bull KTM rider held the lead and looked great early, but wasn’t able to maintain it. 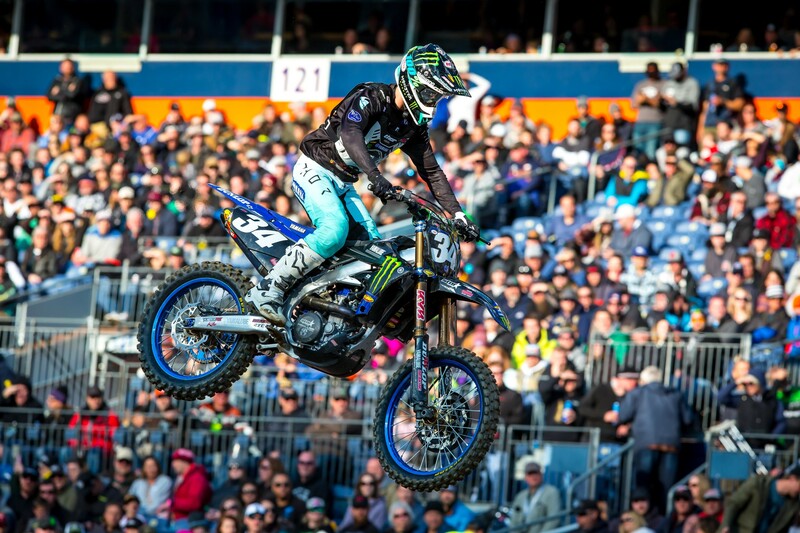 Fourth was….Justin Bogle! He earned it, too, holding tough under relentless pressure in a race long battle with Savatgy, his Rocky Mountain ATV/MC teammate Blake Baggett, Ken Roczen and more. Bogle has been sneaky fast and creative in practice the last few weeks, and then he won his heat race straight up. Fourth matches his finish from San Diego earlier this year, but that was a mud race. This one was rock solid all day and night. 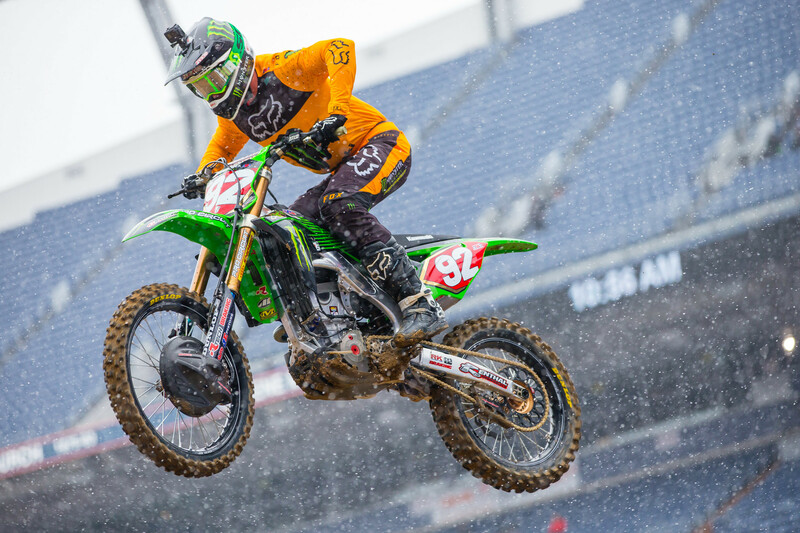 Joey Savatgy dislocated his shoulder last weekend in a crash in Nashville. But the shoulder popped back in quickly, saving him from a lot of residual damage, and he was even able to ride this week. Joey looked like he was struggling in practice, but it came together for him in the night show and he rode well to finish fifth, and also battled Webb for third place for awhile. Blake Baggett was under the radar most of the day but came to life in the final ten laps of the main, he passed Ken Roczen and put pressure on Savatgy, but couldn’t get around. Roczen looked really fast in his heat race, but didn’t have the intensity in the main event. He took seventh. 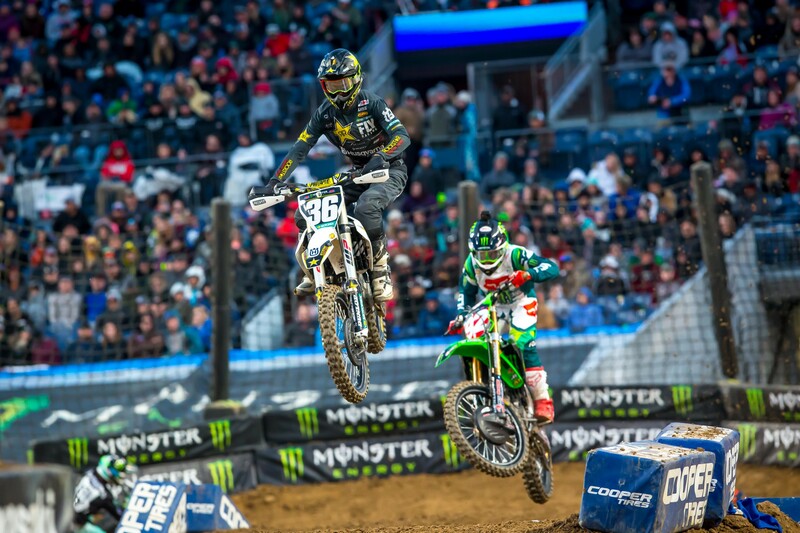 Zach Osborne rode a quiet but effective race for eighth on his Rockstar Energy Husqvarna, and Josh Grant finally put together a complete night for Monster Energy Yamaha, riding well, staying off the ground and finishing ninth. Justin Hill rounded out the top ten on his JGRMX/Yoshimura Suzuki. Dean Wilson has been riding very well as of late, but he took a hard crash in a rhythm lane in the main. We hear he might have a shoulder injury, possibly a broken collarbone, but it will take an official update from the team or Dean himself to know for certain. In the 250 class, the championship pressure was building to a crescendo, with Dylan Ferrandis winning two-in-a-row and cutting Adam Cianciarulo’s points lead to five. Cianciarulo was the better man on this night, though, and he won his fifth race of the season to put the points lead back to eight, with Ferrandis fighting for second. Cianciarulo was obviously pumped, Ferrandis was disappointed. Ferrandis was just a tick off all day, and he admitted he wasn’t comfortable in the freezing cold conditions. “The venue was nice but I did not enjoy the race because it was cold, I was struggling little bit with that. Same for everyone, but I was just struggling a little bit with that,” said Ferrandis. It was his teammate Colt Nichols who was on the gas all day and night, but he blew his start in the main event. He lined up next to Cianciarulo, but Adam got the jump on him and Nichols was forced to come from the back. Michael Mosiman has been getting faster each week on his Rockstar Energy Husqvarna, and when he holeshot the race he was ready to do some battling. It took Cianciarulo several cracks to get by him, and then Mosiman even struck back at one point. The Ferrandis/Nichols duo was able to get him, and then a late crash allowed RJ Hampshire to catch him. In the last corner of the race, Hampshire dove inside and snagged the fourth place spot.